Good morning, friends! I’m super excited to tell you about my new favorite toy — a BOB duallie stroller! I’m sure many of you have heard of BOB strollers before. 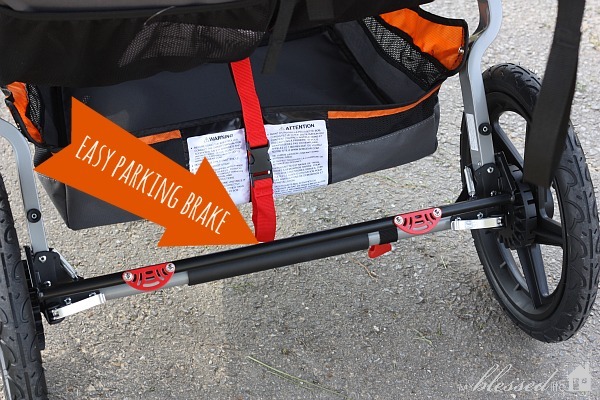 Did you also know that they have bike trailers, car seats and more? 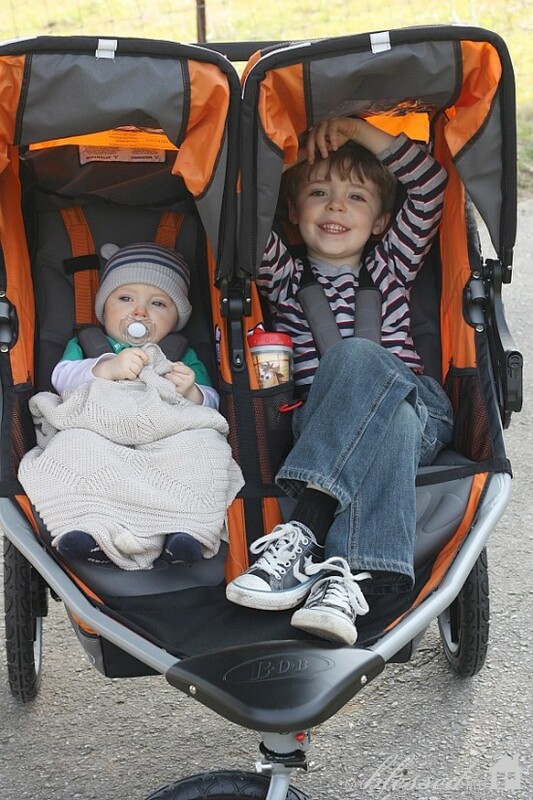 My boys love our BOB Revolution SE stroller. It is perfect for walking and light jogging…just what I need to be doing to lose this baby weight! Y’all. I can’t get over how smooth the ride is as well as how easy it is to push and maneuver. I love the swiveling front wheel. It makes steering the stroller ridiculously easy. See that little red ring? And those sweet little fingers? 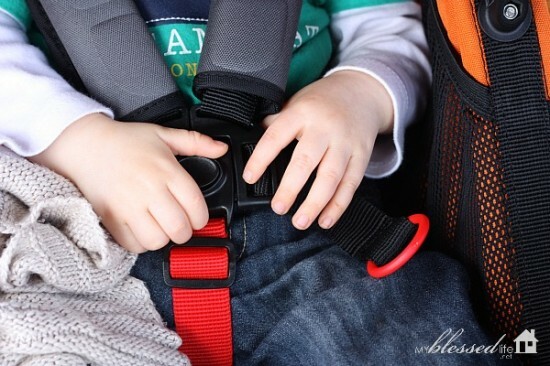 The red ring is a favorite feature for tightening and adjusting the harness for different children. The cup and snack pockets are fabulous because they keep everything organized and neat. The parking brake is one of the easiest that I’ve ever used. And I have a stroller fetish, so I’ve used a bunch of them. Ahem. This shows how far down the canopies go. How fabulous for napping children and for keeping the sun out of their eyes! I’m thrilled to be working with the BOB brand to promote them and their high-quality products across my social media channels. 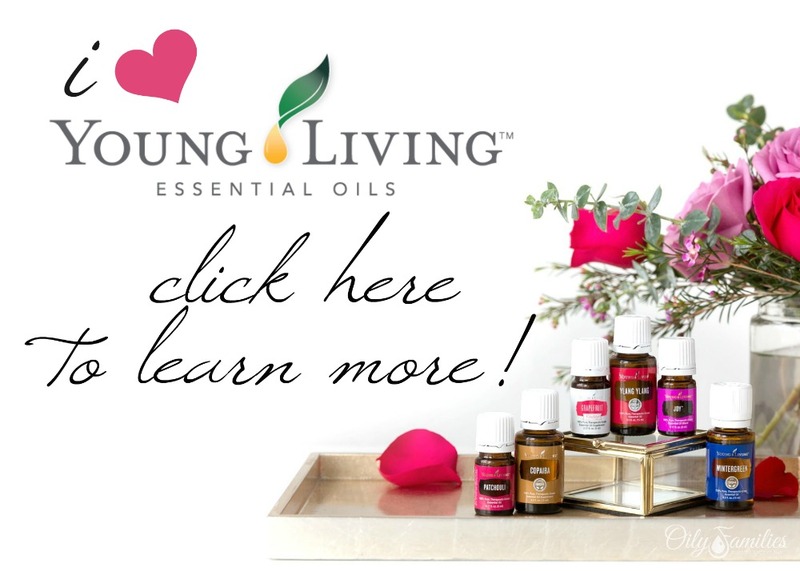 In the mean time, connect with BOB on their website, as well as, Facebook and Twitter! 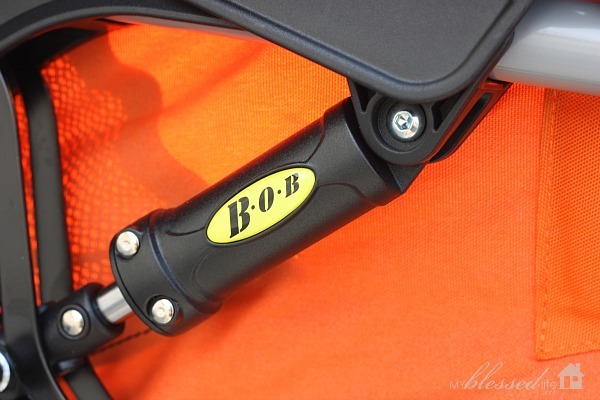 Do you have a BOB stroller?? We have a Bob Ironman and LOVE it! So easy to push! Wish we had a double though! I’m curious, how high does the back go on that one? Our three year old outgrew the ironman…he was too tall and had to hunch over. Wonder if the newer/other models are different. I actually own 2 BOB strollers! Which makes me sound like a bit of an addict, ha! I have both the single and duallie Revolution and love them and use them all the time. Mine double is a little older and I love how far down your shades go! WOW. What an awesome stroller! My oldest two boys are 25 months apart. A double stroller was the highest item on our wish list at the time our second son was born. We were grateful for it, but it was big, clunky, and incredibly hard to manuever. Your stroller looks like it would be a breeze to use! I have a long list of friends who are pregnant with their second children; I’ll have to recommend this stroller to them! Richella @ Imparting Grace´s last blog post ..Decorating decision to make–please help! I have the single and double BOB and I love them! I only wish you could fit your diaper bag underneath in the basket! I would LOVE a Bob stroller! I will be watching for that giveaway! Great features and pictures! I have been wanting one of these!! Especially now that the weather is getting nicer – it would make it easier to get out and get some exercise and fresh air! Oh, I only wish I had this when mine were little! Your boys are darling! Strollers have come a long way! My niece would love this for her many littles! We love our BOB Duallie. It’s 6 years old and run still as smooth as ever. You can push two fairly heavy kids with one finger!! We got ours used, so they resell good as well. I always tell people, GET A BOB! Looks like a nice stroller, Myra. 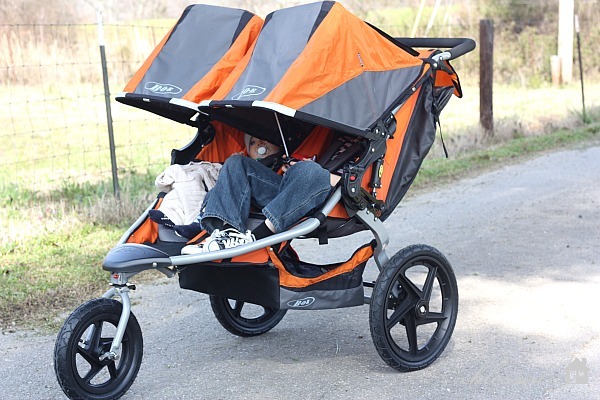 We decided to purchase the Baby Trend double jogging stroller with the one wheel in the front. I was surprised to read many of the features you listed, our stroller had them too (I’ve since sold it as our little ones have outgrown it 🙁 They are 19 months apart so it was my life-saver! I loved it too and think every mommy should own a double stroller 🙂 so nice for day expeditions! I got my Valco 7 years ago when my oldest was a baby. It’s held up well through 3 kids, but if I was doing it over, I would get a BOB. The larger wheels are much better for walking/jogging. A sturdy stroller that I could get out and about in (along with my Ergo 🙂 was the best baby/kid investment we’ve made. Totally worth it! Emily@Decorchick´s last blog post ..A Virtual Trunk Show! I (not so secretly) want to have kids so we can get a BOB. We’ve got a game plan in place – REI Dividend + one of their 20% off coupons and we’ll be set! Maybe we should actually be pregnant first?! Ha. It looks like a great stroller! Just curious, how old is your oldest son? I’m trying to figure out if my 4 yr. old would be too big for this. Thanks! My son is 4.5 and still comfortably fits in the BOB. He is about 40 pounds — I think the BOB actually holds up to a 75 lb. kid. Michelle, thank you! That answers my question. I would love to have a double stroller that my 4 yr. old could ride in whenever he gets tired of walking! Wow this looks great and super stylish! This looks great and comfortable. I would love a BOB!! So many awesome features! this looks awesome Myra! strollers sure have come a long way! 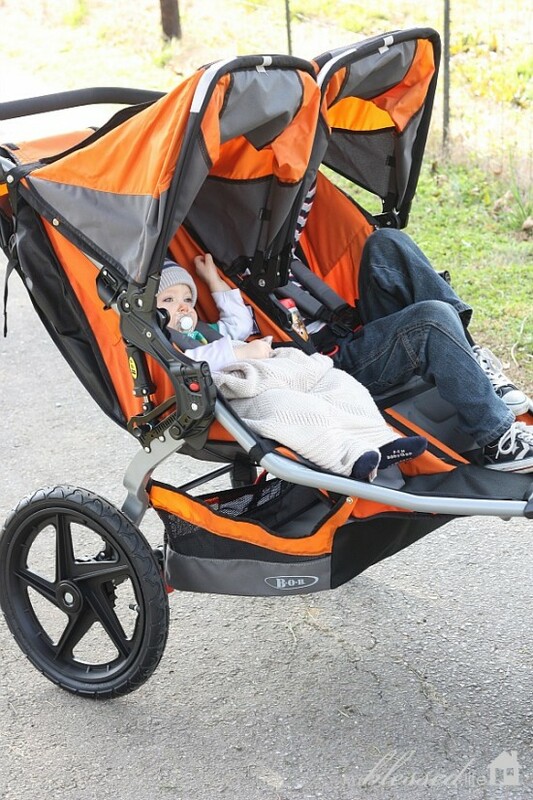 Before I had my son I did a ton of research on the BEST walking/jogging stroller. I was walking 30-40 miles a week and knew I wanted something that was perfect. I ended up getting the BOB via craigslist and ADORE it. We’ve logged hundreds of miles on it and he loves it. The ride is so smooth! Someday we’ll have another little one and I’ll need to upgrade to the dualie! Such cute boys!! That stroller looks amazing! I have been dying to get my hands on a BOB! Now that he’s old enough and I’m ready to run, it would be perfect. Thanks for sharing! We love our BOB stroller too! Jane´s last blog post ..Double Chocolate Milkshake…Move Over, Starbucks. Once you go BOB, you never go back. I suffered through an awful double stroller with 3 kids, and finally with my 4th I got the single BOB and am SO in love! After 3 years, it’s still fabulous and worth the investment! Myra I love that stroller! If Courtney has another baby, I’m going to get one for her. She walks all the time and this will be perfect! Oh how I wish we had strollers like this when my kids were little, it looks fantastic! 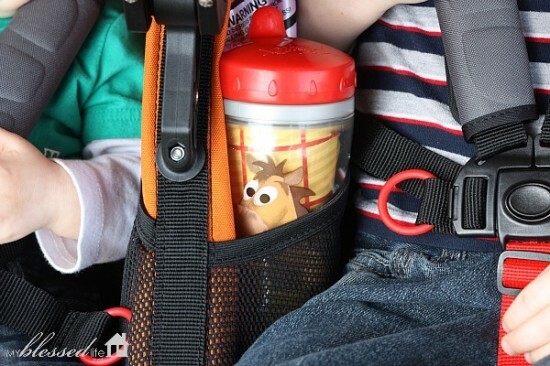 I love the colors and the drink holder – awesome * Thank you for sharing. I’ve heard so many great things about the Bob strollers. Yay, that your kiddos are riding in style. They are wonderful! We have the single and fell in love. Baby #2 is due in a month, and we just purchased the double without hesitation. BOB strollers are the best ever! Myra, we’re so glad that the BOB Duallie is working out for you and your kids. It looks like they’ve found my son’s favorite feature, the rock-collection-pocket in the side of the seat. Enjoy the nicer weather and we look forward to hearing about your adventures! 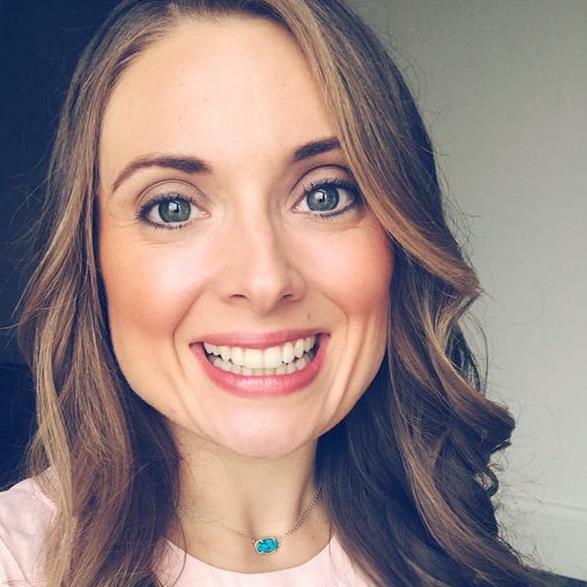 I have had my BOB Ironman since I was seven months pregnant almost five years ago. I wished I would have logged all the miles I have put on that thing! People in our small community know it’s me by the bright yellow color; I am the only one here with one. 🙂 I have ran several 5k races pushing my little man along with me and I wouldn’t have another stroller if one was given to me. I have several accessories that make carrying my phone, a bottle of water, keys, and anything else I need to perfect. The rain shield has come in handy so many times on long runs. It stores nicely in the bottom basket and I leave it there just in case. BOB strollers are well worth the price and because my son is such a light weight; 38 pounds; he will out grow it by age before he excedes the weight limit. It is the only stroller we have had for him and we love it! Nice Bob stroller i like that BOB duallie stroller! and perfect canopy window to see little baby. We did a review on this stroller recently and it’s still one of the best strollers on the market! you for this unique post. 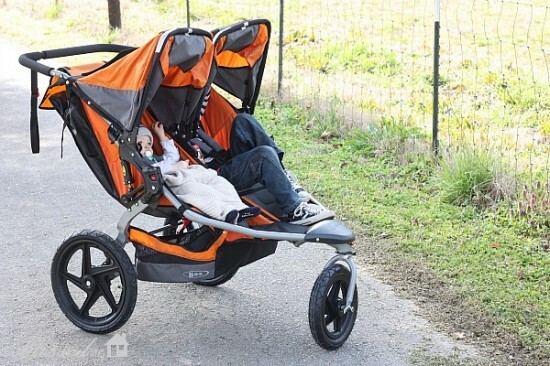 To know Best Jogging Stroller and buy visit the website !